Water utilities prepare for bigger storms and rising seas. 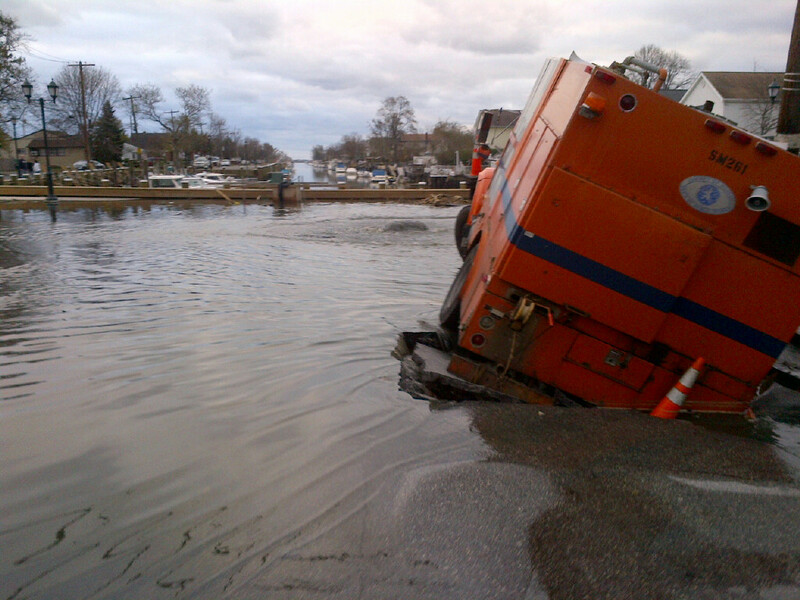 The U.S. Army Corps of Engineers works to repair a levee breach caused by Hurricane Sandy in Montoloking, New Jersey. In the nearly $US 80 billion wake of Superstorm Sandy, the second-most expensive U.S. storm disaster, state legislators and water utility leaders have spoken openly and at length about how climate change will test the nation’s water and wastewater infrastructure in unprecedented ways. The call for action now rings out from the nation’s highest halls of power. On November 15, at a U.S. Senate hearing on a water infrastructure bill — and while at least one wastewater treatment plant in New Jersey continued to pour partially treated sewage into New York Harbor — the Environment and Public Works committee came just short of holding hands to rally support for federal spending to strengthen America’s ports, levees, water treatment facilities, and navigation channels against the lash of destructive storms and rising seas. 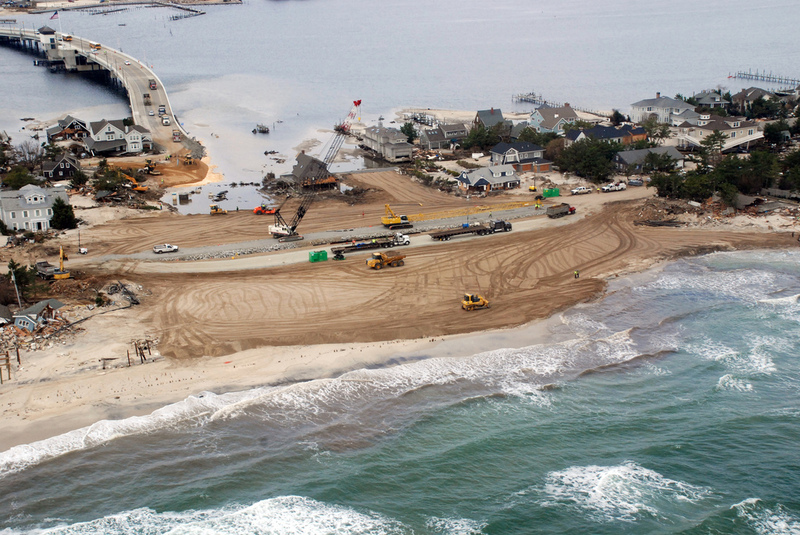 Committee chair Barbara Boxer (D-California) even added a new section to the legislation directing the Army Corps of Engineers to restore coastal ecosystems to act as a storm buffer. The committee’s ranking member, James Inhofe (R-Oklahoma), is one of the most conservative members of Congress. Yet at the hearing he proudly claimed to be a big spender in two areas: national defense and infrastructure. Even Inhofe, though, might blink at Sandy’s damage. Estimates of insured losses because of Sandy range from $US 16 billion to $US 25 billion, and the total economic losses, first estimated at $US 50 billion, continues to rise. This week, Governor Andrew Cuomo (D-New York) pegged storm damage to his state at $US 33 billion, while Governor Chris Christie (R-New Jersey) estimated a bill of nearly $US 30 billion for the Garden State. Add the costs of new flood prevention measures and the two states have requested nearly $US 79 billion from the federal government. If “sustainability” was the environmental buzz phrase of the last two decades, then “resiliency,” a concept with deep roots in many academic disciplines, might be the new coin of the 21st century public policy realm as utilities prepare for rising seas and fiercer storms. 1. Every individual and community in the nation has access to the risk and vulnerability information they need to make their communities more resilient. 2. All levels of government, communities, and the private sector have designed resilience strategies and operation plans based on this information. 3. Proactive investments and policy decisions have reduced loss of lives, costs, and socio-economic impacts of future disasters. 4. Community coalitions are widely organized, recognized, and supported to provide essential services before and after disasters occur. 5. Recovery after disasters is rapid and the per capita federal cost of responding to disasters has been declining for a decade. 6. Nationwide, the public is universally safer, healthier, and better educated. Superstorm Sandy made such thinking relevant at the national level. Local government officials from coast to coast, after all, have acknowledged for years the threats that a warming world pose to water and sewer infrastructure. One of the first such assessments for the New York City metro area was published in 2001. Rising seas, higher tides, and bigger storm surges put wastewater treatment plants at risk of flooding – especially those which are located along rivers and coasts. Local concerns were confirmed this week by new research from European and American scientists published in the journal Environmental Research Letters, which found that the seas are rising 60 percent faster than previous estimates. Not only that, but the deluge of water from a heavy storm can inundate a plant’s treatment capacity and force utilities to let untreated sewage flow downstream, where it might foul drinking water supplies, force beach closures, and threaten public health. Immediately following a storm, the most urgent demand is to return drinking water and wastewater plants to full operations as quickly as possible. CH2M Hill, a global engineering firm based in Colorado, has a contract with the North Hudson Sewage Authority to operate a wastewater plant in Hoboken, New Jersey, across the river from Manhattan. During Sandy, the plant was submerged in a 4.3-meter (14-foot) storm surge and its equipment was flooded. Elisa Speranza, the president of the CH2M Hill’s operations and maintenance group, said that the plant’s pump stations were back online by October 31, two days after the storm hit, but that the plant was not fully treating all sewage until November 9. Sterba, whose company operates facilities in New Jersey and Long Island, told Circle of Blue that the biggest problem was losing electrical power to run the treatment plants. American Water had some 200 remote generators as back up, but had trouble getting fuel to them. “In the same way people were standing in line for gas, we couldn’t get trucks to the plants,” Sterba said. Those trucks that were able to get through often had no place to store the fuel. As a solution, American Water partnered with municipal governments to use the spare capacity at fire departments and police stations. The lesson, Sterba said, is to set up these relationships long beforehand. A more bizarre emergency happened to American Water in Nassau County, Long Island, where a sewer pipe broke and created a sinkhole near a street storm drain. A parked county utility truck fell into the sinkhole and ended up breaking a water main that the company operates. The pipe was repaired within 24 hours. Now that the emergency phase has passed, discussions are turning toward the future. Utilities need to identify, according to Fleming, which assets will be a chronic liability and which would be inundated by infrequent but severe storms. Seattle Public Utilities is using what Fleming calls “forensic meteorology” to look at previous weather anomalies and to pinpoint the types of storms — rivers of moisture-laden air from the tropics or air masses colliding after being split by the Olympic Mountains to the west of the rainy city — that pose the biggest risk. After Superstorm Sandy, a ruptured sewer line caused a sink hole to form in Nassau County, Long Island. A county utility truck toppled into the hole, breaking a water main operated by American Water. The goal of all this is to spend precious dollar resources effectively. In San Francisco, surrounded by water on three sides, the city’s water utility is already seeing the effects of higher tides and higher seas on its stormwater collection pipes. On October 31, after taking a helicopter tour of his state’s storm-blighted metropolis and while salt water still filled Manhattan subway tunnels, Governor Andrew Cuomo (D-New York) was already talking about the future. We need a “fundamental rethinking of our built environment,” the first-term governor said near the end of a 45-minute press conference. Superstorm Sandy had knocked out power to millions in the northeastern United States, flooded New York City’s transit system, and caused billions of dollars in damages, in addition to swamping wastewater treatment plants from Long Island to Ohio. The next day, Mayor Michael Bloomberg — who introduced a plan two years ago to spend as much as $US 1.5 billion over the next 20 years on wetlands, grassy roofs, and other natural systems to reduce flooding — endorsed President Barack Obama for re-election, largely because the president would be more willing to act on climate change. As the city rebuilds, the conversation that Cuomo urged is just beginning. Some people want flood gates in New York Harbor, which would cost tens of billions of dollars. Others argue for wetland restoration, barrier islands, or oyster beds that would absorb the energy and water of a large storm surge. Whatever the outcome, all coastal cities should pay attention – and many already are. The San Francisco Public Utilities Commission anticipates spending $US 20 million to $US 40 million over the next five years to prevent backflow into the pipes, where the salt water can compromise the biological treatment process. The problem for utilities is that they are already looking at billions of dollars in repairs for existing pipes and facilities. “Even before we talk about the added things needed for resiliency, the basic infrastructure is being neglected,” said Sterba, who noted that, on average, water and sewer pipes in the U.S. are being replaced at a rate of once every 250 to 300 years. That sentiment — that utilities are barely investing enough to keep up with the infrastructure they own, let alone to make appropriate adaptations — has come up frequently this year in conversations with utility leaders and industry groups and in testimony before Congress. In 2002, the U.S. Environmental Protection Agency found a gap of more than $US 500 billion between what is being spent on clean water, drinking water, and operations and what is needed over the next 20 years to maintain service. This figure does not include the expenditures necessary to deal with climate change, which the EPA will include for the first time in its next survey of national water infrastructure needs, due to Congress in 2013. Yet there are signs that new thinking about cheaper, more resilient systems has not only taken root, but is flourishing. For example, Speranza lived in New Orleans during Hurricane Katrina in 2005. She told Circle of Blue that Katrina was a painful lesson about the cost of losing the storm-deflecting protection of natural vegetation — southern Louisiana’s coastal wetlands, in that case. Since then, from the East Coast’s Philadelphia to the West Coast’s Seattle, and even in Midwestern cities like Milwaukee, city managers have embraced green infrastructure as a complement to the pipes, pumps, and levees that support the urban skeleton. “Fifteen years ago, green infrastructure would have been derided as ‘hippie infrastructure’ by utility leaders,” said Speranza, who took part in a White House conference on green infrastructure in September. With the nation’s capital engaged in a seminal debate about taxes, spending cuts, and deficit reduction, will Congress – and particularly the House of Representatives, which has proposed deep cuts to water programs in the 2013 budget – choose to spend more on water infrastructure and on natural flood defenses? In the next few weeks, the committee and floor will most likely consider a water-infrastructure spending bill. The vote, coming so soon after Superstorm Sandy, will provide a very clear signal about what Congress is prepared to do.